N-S is a shared-key authentication protocol designed to generate and propagate a session key, i.e., a shared key for subsequent symmetrically encrypted communication. Note that there is no public key infrastructure in place. Now lets understand Needham-Schroeder protocol with symmetric key encryption because its the one used in kerberos infrastructure. Needham-Schroeder protocol allows to prove the identity of the end users communicating, and also prents a middle man from eavesdropping. Nonce: Nonce is a randomly generated string which is only valid for some period of time, This is used in encryption protocols to prevent replay attack. For example if somebody captures a packet during the communication between me and a shopping website, he can resend the packet without decrypting it, and the server can accept the packet and do operations on it. To prevent this, nonce(the random value generated) is added to the data, so as the server can check if that nonce is valid, or expired. Lets understand this protocol by taking an example communication between two machines called Machine A and Machine B. The main thing in this protocol is that there is a trusted middle man or call him an arbitrator. This trusted middle man is a server. If an X machine wants to communicate, with Y machine, then X has to contact the middle man server, saying am interested in communicating with Y.
SK(S) = this is the symmetric key/session key generated by the server for both machine A and Machine B. Lets understand all the messages above mentioned. Initially before going ahead with the explanation, make it clear that the symmetric keys of both machine A, Machine B are already shared with the Middle Man server. Also any other machine in the network also shares its respective Symmetric keys with the Middle Man server. 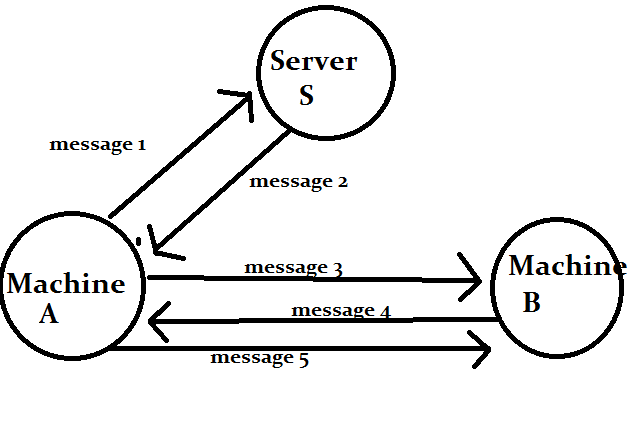 Message 1: Machine 1 sends a message to Server S saying that i want to communicate with Machine B. Message 2: Server S sends message 2 back to Machine A containing SK(S), and also one more copy of SK(S) encrypted with SK(BS), this copy will be send to Machine B by Machine A. Message 3: Machine A forwards the copy of SK(S), to Machine B, who can decrypt it with the key it has because it was encrypted by the Middle man server with the Machine B's symmetric Key SK(BS). Message 4: Machine B sends back Machine A a nonce value encrypted by SK(S). to confirm that he has the symmetric key or session key provided by the middle man server. There are still some vulnerability in this protocol for replay attacks which is fixed by the timestamp implimentation in this, when used by kerberos.